2017 marks the centenary of the fourth year of British fighting in World War I. It was in August 1917 that Wilfred Owen and Siegfried Sassoon, later to become two of the most famous British war poets, met while hospitalised at Craiglockhart military hospital in Edinburgh . Now part of Napier University’s campus, Craiglockhart was then a military hospital for officers, specialised in the treatment of patients suffering from war neuroses. The medical treatment of war neurosis, also referred to as neurasthenia or shell-shock, was then at its earliest stage. 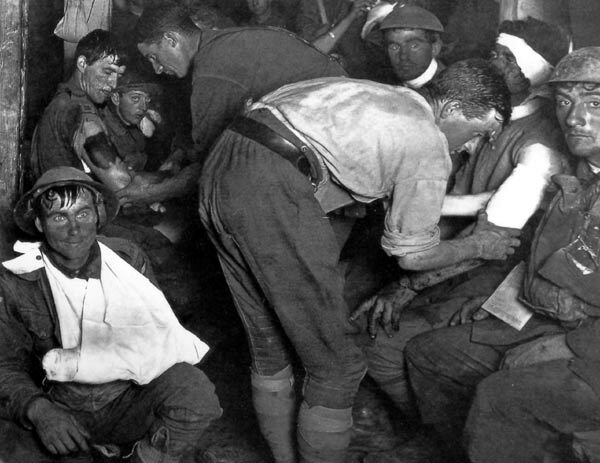 The study of mental illnesses produced by war was often problematic, as many failed to understand, or ignored to the benefit of the war effort, that a soldier wounded in their mind was not malingering. Our PhD theses collection includes some early studies of war neuroses which I have found fascinating. While most of the war-related studies dating back to 1918-1921 focused on gas poisoning, diphtheria, and scabies to name a few, Thomas Crisp’s PhD Thesis, awarded in 1918, focused on ‘Shell concussion, “shell shock” and allied conditions, result of war strain, or the psycho-neuroses of the war’. This was just the first of the studies of war neuroses carried out at our University: two years later, Frederick Dillon was awarded a PhD for ‘A survey of the war neuroses’  and William Gifford Wyllie published his MD ‘War neuroses. 150 cases in h. m. navy’. I digitised the latter a month ago and I found it very intriguing. Its focus on navy soldiers shifted my personal perception of WWI as a conflict almost exclusively fought in the trenches. I also appreciated the fact that it complemented the study of mental illnesses produced by land warfare, widening the scope of the study of war neuroses while simultaneously pointing out the distinctive features of war neuroses in the navy. Among the general observations that struck me more, the author points out that the incidence of serious neuroses in the navy was lower than in the infantry. I was shocked to realise that this was partly because, when a fight happened at sea and a boat was bombed or torpedoed, chances were that all the soldiers died. No survivors, no war neurotics. Another reason why I have found this MD fascinating is that it seems representative of the shift in the perception and the study of war neuroses that took place at the end of the war. Wyllie presents warfare neuroses as illnesses produced by shock and fatigue; they have distinctive symptoms that are hard to feign and therefore allow to exclude, at close clinical examination, that patients are malingering. This went against the ill-founded but widespread suspicion that some war neurotics were impostors. The author carefully investigates the traumatic war events that caused the neurosis, but, significantly, he also considers hereditary and acquired neurotic tendencies ‘to be the most important predisposing causes towards a neurosis’. According to Marc-Antoine Crocq , it was a controversial matter at the time whether the neuroses were caused exclusively by traumatic events or it was necessary to delve into the patient’s personality and clinical history, not less because war neuroses seemed to question the validity of psychoanalytical theories. In this respect, Wyllie’s position seems clear: in his case descriptions, the sections ‘Family History’ and ‘Previous [Patient’s] History’ always come before ‘War Service’. First at Crystal Palace then at two air stations underwent several air raids which frightened him very much. Was employed in 1917 in experimenting with explosives. In July of that year after an explosion had all his clothes on fire. Got a severe shock but carried on. In Sept. the camp was set alight by an explosion, which threw the patient several yards, but he did not lose consciousness. After this he still tried to carry on. The various hardships Armourer Mechanic I, aged 28 had to go through, matched with Wyllie’s scientific register, generate a tragi-comical effect, which nevertheless allows us to empathize with the patient’s suffering and attempts to ‘carry on’. I will add a link to the digital copy of Wyllie’s thesis once uploaded on ERA. Image credit: public domain, via Wikimedia Commons, https://goo.gl/QUebJL. Colin Water has recently detailed this fruitful encounter in an article that you can read at: https://goo.gl/VFfdaF. This thesis is accessible on ERA at: https://www.era.lib.ed.ac.uk/handle/1842/8150. ‘From shell shock and war neurosis to posttraumatic stress disorder: a history of psychotraumatology’, Dialogues in Clinical Neuroscience, https://goo.gl/2XD5mI. This entry was posted in Uncategorized by mpolvara. Bookmark the permalink.